IN these words we find the record of the event which completed the Church, and endowed it with that mysterious power which then was, and ever since has been, the source of its true life and of its highest success. The time when the gift of the Spirit was vouchsafed is marked for us as "when the day of Pentecost was now come." Here again, as in the fact of the ascension and the waiting of the Church, we trace the outline of Christianity in Judaism, and see in the typical ceremonial of the old dispensation the outline and shadow of heavenly realities. I Now let us take the circumstances of the Pentecostal blessing as they are stated, for every separate detail bears with it an important message. The place and the other circumstances of the outpouring of the Spirit are full of instruction. The first disciples were all with one accord in one place. There was unity of spirit and unity in open manifestation to the world at large. Christ’s disciples, when they received the gifts of heaven’s choicest blessings, were not split up into dozens of different organisations, each of them hostile to the others, and each striving to aggrandise itself at the expense of kindred brotherhoods. They had keenly in remembrance the teaching of our Lord’s great Eucharistic supplication when He prayed to His Father for His people that "they may all be one; even as Thou, Father, art in Me, and I in Thee that the world may believe that Thou didst send Me." There was visible unity among the followers of Christ; there was interior love and charity, finding expression in external union which qualified the disciples for the fuller reception of the spirit of love, and rendered them powerful in doing God’s work amongst men. The state of the Apostles and the blessing then received have an important message for the Christianity of our own and of every age. What a contrast the Christian Church—taking the word in its broadest sense as comprising all those who profess and call themselves Christians—presents at the close of the nineteenth when compared with the opening years of the first century! May not many of the problems and difficulties which the Church of to-day experiences be traced up to this woeful contrast? Behold England nowadays, with its two hundred sects, all calling themselves by the name of Christ; take the Christian world, with its Churches mutually hostile, spending far more time and trouble on winning proselytes one from the other than upon winning souls from the darkness of heathenism; -surely this one fact alone, the natural result of our departure from the Pentecostal condition of unity and peace, is a sufficient evidence of our evil plight. We do not purpose now to go into any discussion of the causes whence have sprung the divisions of Christendom. "An enemy hath done this" is a quite sufficient explanation, for assuredly the great enemy of souls and of Christ has counter-worked and traversed the work of the Church and the conversion of the world most effectually thereby. There are some persons who rejoice in the vast variety of divisions in the Church; but they are shortsighted and inexperienced in the danger and scandals which have flowed, and are flowing, from them. It is indeed in the mission field that the schisms among Christians are most evidently injurious. When the heathen see the soldiers of the Cross split up among themselves into hostile organisations, they very naturally say that it will be time enough when their own divergences and difficulties have been reconciled to come and convert persons who at least possess internal union and concord. The visible unity of the Church was from the earliest days a strong argument, breaking down pagan prejudice. Then, again, not only do the divisions of Christians place a stumbling-block in the way of the conversion of the heathen, but they lead to a wondrous waste of power both at home and abroad. Surely one cannot look at the religious state of a town or village in England without realising at a glance the evil results of our divisions from this point of view. If men believe that the preaching of the Cross of Christ is the power of God unto salvation, and that millions are perishing from want of that blessed story, can they feel contentment when the great work of competing sects consists, not in spreading that salvation, but in building up their own cause by proselytising from their neighbours, and gathering into their own organisation persons who already have been made partakers of Christ Jesus? And if this competition of sects be injurious and wasteful within the bounds of Christendom, surely it is infinitely more so when various contending bodies concentrate all their forces, as they so often do, on the same locality in some unconverted land, and seem as eagerly desirous of gaining proselytes from one another as from the mass of paganism. II Furthermore, we have brought before us the external manifestations or evidences of the interior gift of the Spirit really bestowed upon the Apostles at Pentecost. There was a sound as of a rushing mighty wind; there were tongues like as of fire, a separate and distinct tongue resting upon each disciple; and lastly there was the miraculous manifestation of speech in divers languages. Let us take these spiritual phenomena in order. First, then, "there came from heaven a sound as of the rushing of a mighty wind, and it filled all the house where they were sitting"; a sign which was repeated in the scene narrated in the fourth chapter and the thirty-first verse, where we are told that "when they had prayed, the place was shaken wherein they were gathered together; and they were all filled with the Holy Ghost." The appearances of things that were seen responded to the movements and powers that were unseen. It was a supernatural moment. The powers of a new life, the forces of a new kingdom were coming into operation, and, as the result, manifestations that never since have been experienced found place among men. We can find a parallel to what then happened in scientific investigations. Geologists and astronomers push back the beginning of the world and of the universe, at large to a vast distance, but they all acknowledge that there must have been a period when phenomena were manifested, powers and forces called into operation, of which men have now no experience. The beginning, or the repeated beginnings, of the various epochs must have been times of marvels, which men can now only dream about. Pentecost was for the Christian with a sense of the awful importance of life and of time and of the individual soul a far greater beginning and a grander epoch than any mere material one. It was the beginning of the spiritual life, the inauguration of the spiritual kingdom of the Messiah, the Lord and Ruler of the material universe; and therefore we ought to expect, or at least not to be surprised, that marvellous phenomena, signs and wonders even of a physical type, should accompany and celebrate the scene. The marvels of the story told in the first of Genesis find a parallel in the marvels told in the second of Acts. The one passage sets forth the foundation of the material universe, the other proclaims the nobler foundations of the spiritual universe. Let us take it again from another point of view. Pentecost was, in fact, Moses on Sinai or Elijah on Horeb over again, but in less terrific form. Moses and Elijah may be styled the founder and the re-founder of the old dispensation, just as St. Peter and the Apostles may be called the founders of the new dispensation. But what a difference in the inaugural scene! No longer with thunder and earthquake, and mountains rent, but in keeping with a new and more peaceful economy, there came from heaven the sound as of the rushing of a mighty wind. It is not, too, the only occasion where the idea of wind is connected with that of the Divine Spirit and its mysterious operations. How very similar, as the devout mind will trace, are the words and description of St. Luke when narrating this first outpouring of the Spirit, to the words of the Divine Master repeated by St. John, "The wind bloweth where it listeth, and thou hearest the voice thereof, but knowest not whence it cometh, and whither it goeth: so is every one that is born of the Spirit." There appeared, too, tongues, separate and distinct, sitting upon each of them. The outward and visible sign manifested on this occasion was plainly typical of the new dispensation and of the chief means of its propagation. The personality of the Holy Ghost is essentially a doctrine of the new dispensation. The power and influence of God’s Spirit are indeed often recognised in the Old Testament. Aholiab and Bezaleel are said to have been guided by the Spirit of God as they cunningly devised the fabric of the first tabernacle. The Spirit of Jehovah began to move Samson at times in the camp of Dan; and, on a later occasion, the same Spirit is described as descending upon him with such amazing force that he went down and slew thirty men of Ashkelon. These and many other similar passages present to us the Jewish conception of the Spirit of God and His work. He was a force, a power, quickening the human mind, illuminating with genius and equipping with physical strength those whom God chose to be champions of His people against the surrounding heathen. Aholiab’s skill in mechanical operations, and Samson’s strength, and Saul’s prophesying, and David’s musical art, were all of them the gifts of God. What a noble, what a grand, inspiring view of life and life’s gifts and work, is there set before us. It is the old lesson taught by St. James, though so often forgotten by men when they draw a distinction between things sacred and things secular, "Every good gift and every perfect boon is from above, coming down from the Father of light." A deeper view, indeed, of the Divine Spirit and His work on the soul can be traced in the prophets, but then they were watchers upon the mountains, who discerned from afar the approach of a nobler and a brighter day. "The Spirit of the Lord is upon me, because He hath anointed me to preach the gospel to the poor." That was Isaiah’s statement of his work as adopted by our Lord; and now, at the very foundation of the Church, this deeper and nobler tone of thought concerning the Spirit is proclaimed, when there appeared tongues like as of fire sitting upon each of them. The sign of the Holy Spirit’s presence was a tongue of fire. It was a most suitable emblem, pregnant with meaning, and indicative of the large place which the human voice was to play in the work of the new dispensation, while the supernatural fire declared that the mere unaided human voice would avail nothing. The voice needs to be quickened and supported by that Divine fire, that superhuman energy and power, which the Holy Ghost alone can confer. The tongue of fire pointed on the Pentecostal morn to the important part in the Church’s life, and in the propagation of the gospel, which prayer, and praise, and preaching would hereafter occupy. It would have been well, indeed, had the Church ever remembered what the Holy Ghost thus taught, specially concerning the propagation of the gospel, for it would have been thereby saved many a disgraceful page of history. The human tongue, illuminated and sanctified by fire from the inner sanctuary, was about to be the instrument of the gospel’s advancement, -not penal laws, not the sword and fire of persecution; and so long as the divinely-appointed means were adhered to, so long the course of our holy religion was one long-continued triumph. But when the world and the devil were able to place in the hands of Christ’s spouse their own weapons of violence and force, when the Church forgot the words of her Master, "My kingdom is not of this world," and the teachings embodied in the symbol of the tongue of fire, then spiritual paralysis fell upon religious effort; and even where human law and power have compelled an external conformity to the Christian system, as they undoubtedly have done in some cases, yet all vital energy, all true godliness, have been there utterly lacking in the religion established by means so contrary to the mind of Christ. Very good men have made sad mistakes in this matter. Archbishop Ussher was a man whose deep piety equalled his prodigious learning, yet he maintained that the civil sword ought to be used to repress false doctrine; the divines of the Westminster Assembly have left their opinion on record, that it is the duty of the magistrate to use the sword on behalf of Christ’s kingdom; Richard Baxter taught that the toleration of doctrines which he considered false was sinful; and all of them forgot the lesson of the day of Pentecost, that the tongue of fire was to be the only weapon permissible in the warfare of the kingdom whose rule is over spirits, not over bodies. The history of religion in England amply proves this. The Church of England enjoyed, about the middle of the last century, the greatest temporal prosperity. Her prelates held high estate, and her security was fenced round by a perfect bulwark of stringent laws. Yet her life-blood was fast ebbing away, and her true hold upon the nation was speedily relaxing. The very highest ranks of society, whom worldly policy attached nominally to her communion, had lost all faith in her supernatural work and commission. A modern historian has shown this right well in his description of the death-scene of Queen Caroline, a woman of eminent intellectual qualities, who had played no small part in the religious life of this nation during the reign of her husband George II Queen Caroline came to die, and was passing away surrounded by a crowd of attendants and courtiers. The whole Court, permeated by the spirit of earthliness which then prevailed, was disturbed by the death of the Queen’s body, but no one seems to have thought of the Queen’s soul, till some one mildly suggested that, for decency’s sake, the Archbishop of Canterbury should be sent for that he might offer up prayer with the dying woman. Writing here in Ireland, I cannot forget that it was just the same with us at that very period. Religion was here upheld by Worldly power; the Church, which should have been viewed as simply a spiritual power, was regarded and treated as a mere branch of the civil service, and true religion sank to its lowest depths. And we reaped in ourselves the due reward of our deeds. The very men whose voices were loudest in public for the repression of Romanism were privately living in grossest neglect of the offices and laws of religion and morality, because they in their hearts despised an institution which had forgotten the Pentecostal gift, and sought victory with the weapons of the flesh, and not with those of the spirit. May God for evermore protect His Church from such miserable mistakes, and lead her to depend more and more upon the power of the blessed and ever-present Pentecostal gift! III Lastly, in this passage we find another external proof of the Spirit’s presence in the miraculous gift of tongues. That gift indicated to the Apostles and to all ages the tongue as the instrument by which the gospel was to be propagated, as the symbol fire indicated the cleansing and purifying effects of the Spirit.49 The gift of tongues is one that has ever excited much speculation, and specially so during the present century, when, as some will remember, an extraordinary attempt to revive them was made, some sixty years ago, by the followers of the celebrated Edward Irving. Devout students of Scripture have loved to trace in this incident at Pentecost, at the very foundation of the new dispensation, a reversal of that confusion of tongues which happened at Babel, and have seen in it the removal of "the covering cast over all peoples, and the veil that is spread over all nations. "50 The precise character of the gift of tongues has of late years exercised many minds, and different explanations have been offered of the phenomena. Some have viewed it as a miracle of hearing, not of speaking, and maintained that the Apostles did not speak different languages at all, but that they all spake the one Hebrew tongue, while the Jews of the various nationalities then assembled miraculously heard the gospel in their own language. The miracle is in that case intensified one hundredfold; while not one single difficulty which men feel is thereby alleviated. Meyer and a large number of German critics explain the speaking with tongues as mere ecstatic or rapturous utterances in the ordinary language of the disciples. Meyer thinks too that some foreign Jews had found their way into the band of the earliest disciples. They naturally delivered their ecstatic utterances, not in Aramaic, but in the foreign tongues to which they were accustomed, and legend then exaggerated this natural fact into the form which the Acts of the Apostles and the tradition of the Christian Church have ever since maintained.51 It is, indeed, rather difficult to understand the estimate formed by such critics of the gift of tongues, whether bestowed on the day of Pentecost or during the subsequent ministrations of St. Paul at Corinth and Ephesus. Meyer is obliged to confess that there were some marvellous phenomena in Corinth and other places to which St. Paul bears witness. He describes himself as surpassing the whole Corinthian Church in this particular gift, (1Cor 14:18) so that if St. Paul’s testimony is to be relied upon, -and Meyer lays a great deal of weight upon it, -we must accept it as conclusively proving that there existed a power of speaking in various languages among the first Christians. But the explanation offered by many critics of the gift of tongues as undoubtedly exercised at Corinth reduces it to something very like those fanatical exhibitions, witnessed among the earliest followers of the Irvingite movement, or, to put it plainly, to a mere uttering of gibberish, unworthy of apostolic notice save in the language of sternest censure, as being a disorderly and foolish proceeding disgraceful to the Christian community. Now this traditional interpretation has not only the authority of the past on its side; we can also see many advantages which must have accrued from a gift of this character. The preface we have just cited states that the tongues were bestowed for the preaching of the gospel among all nations. And surely not merely as a striking sign to unbelievers, but also as a great practical help in missionary labours, such a gift of tongues would have been invaluable to the Church at its very birth. There was then neither time, nor money, nor organisation to prepare men as missionaries of the Cross. A universal commission and work were given to twelve men, chiefly Galilean peasants, to go forth and found the Church. How could they have been fitted for this work unless God had bestowed upon them some such gift of speech? The vast diversity of tongues throughout the world is now one of the chief hindrances with which missionary effort has to contend. Years have often to elapse before any effective steps can be taken in the work of evangelisation, simply because the question of the language bars the way. It would have been only in accordance with God’s action in nature, where great epochs have been ever signalised by extraordinary phenomena, if such a great era-making epoch as the birth of the Church of Christ had been marked with extraordinary spiritual powers and developments, which supplied the want of that learning and those organisations which the Lord now leaves to the spiritual energies of the Church itself. But it is sometimes said, we never hear of this power as used by the Apostles for missionary purposes. Nothing, however, is a surer rule in historical investigations than this, "Never trust to mere silence," specially when the records are but few, scanty, fragmentary. We know but very little of the ways, worship, actions of the Apostles. Silence is no evidence either as to what they did or did not do. Some of them went into barbarous and distant lands, as history states. Eusebius (3:1) tells us that St. Thomas received Parthia as his allotted region, while St. Andrew taught in Scythia. Eusebius is an author on whom great reliance is justly placed. He is one, too, whose accuracy and research have been again and again confirmed in our own day by discoveries of every kind. I see, then, no reason why we should not depend upon him upon this point as well as upon others. Now if the Apostles taught in Scythia and Parthia, what an enormous advantage it must have given them in their work among a strange and barbarous people if, by means of the Pente costal blessing, they could at once proclaim a crucified Saviour. 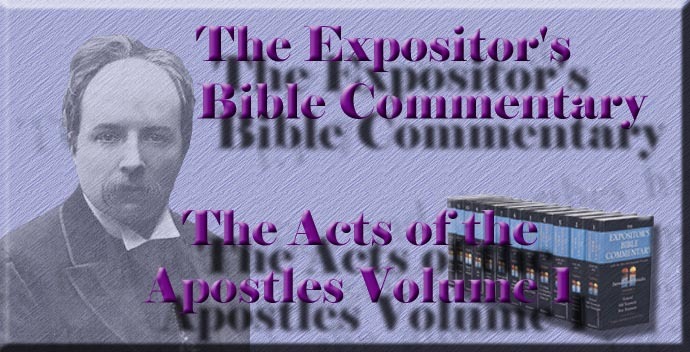 It is sometimes said, how ever, the gift of speaking with foreign languages was not required by the Apostles for missionary purposes, as Greek alone would carry a man all through the world, and Greek the Apostles evidently knew. But people in saying so forget that there is a great difference between possessing enough of a language to travel over the world, and speaking with such facility as enables one to preach. English will now carry a man over the world, but English will not enable him to preach to the people of India or of China. Greek might carry Apostles all over the Roman Empire, and might enable St. Thomas to be understood by the courtiers of the great kings of Parthia, where traces of the ancient Greek language and civilisation, derived from Alexander’s time, long prevailed. But Greek would not enable a primitive Christian teacher to preach fluently among the Celts of Galatia, or of Britain, or among the natives of Spain or of Phrygia, or the barbarians of Scythia.54 We see from St. Paul’s case how powerful was the hold which the Aramaic language had over the people of Jerusalem. When the excited mob heard St. Paul speak in the Hebrew tongue they listened patiently, because their national feelings, the sentiments which sprang up in childhood and were allied with their noblest hopes, were touched. So must it have been all the world over. The Pentecostal gift of tongues was a powerful help in preaching the gospel, because, like the Master’s promise to assist their minds and their tongues in the hour of need, it freed the Apostles from care, anxiety, and difficulties, which would have sorely hindered their great work. But while I offer this explanation, I acknowledge that it has its own difficulties; but then every theory has its difficulties, and we can only balance difficulties against difficulties, selecting that theory which seems to have the fewest. The conduct, for instance, of the Corinthians, who seem to have used the gift of tongues simply to minister to the spirit of display, not to edification or to missionary work, seems to some a great difficulty. But after all is not their conduct simply an instance of human sin, perverting and misusing a divine gift, such as we often see still? God still bestows His gifts, the real outcome and work of the Spirit. Man takes them, treats them as his own, and misuses them for his own purposes of sin and selfishness. What else did the Corinthians do, save that the gift which they abused was an exceptional one; but then their circum stances, times, opportunities, punishments, all were exceptional and peculiar. The one thing that was not peculiar was this, the abiding tendency of human nature to degrade Divine gifts and blessings. There must, we again repeat, be difficulties and mystery connected with this subject, no matter what view we take. Perhaps, too, we are no fitting judges of the gifts be stowed on the primitive Church, or the phenomena manifested under such extraordinary circumstances, when everything, every power, every, force, every organisation, was arrayed against the company of the twelve Apostles. Surely miracles and miraculous powers seem absolutely necessary and natural in such a case.55 We are not now sufficient or capable judges of events as they then existed. Perhaps, too, we are not sufficient judges because we do not possess that spirit which would make us to sympathise with and understand the state of the Church at that time. "They were all together in one place." The Church was then visibly united, and internally united too. A nineteenth-century Christian, with the endless divisions of Christendom, is scarcely the most fitting judge of the Church and the Church’s blessings when the Spirit of the Master pervaded it and the prayer of the Master for visible unity was fulfilled in it. Christendom is weak now from its manifold divisions. Even in a mere natural way, and from a mere human point of view, we can see how its divisions destroy its power and efficacy as Christ’s witness in the world. But when we take the matter from a spiritual point of view, we cannot even guess what marvellous gifts and endowments, needful for the edification of His people and the conversion of the world, we now lack from want of the Divine charity and peace which ruled the hearts of the twelve as they assembled in the upper room that Pentecostal morn. We shall better understand primitive gifts when we get back primitive union. In the last lecture I have already given the reference to Lightfoot's and Mede's works where this point is fully worked out. The same view has practically been taught by some modern sects, who have proclaimed that all of the Old Testament and the whole of our Lord's teaching till He died were intended for Jews only, and have no relation to Christians. It is hard to say how such persons regard the Old Testament and the greater part of the four Gospels, save as interesting fossils to be hung up in a museum of comparative religion. Prayer for all estates of men in the Holy Catholic Church, in Jeremy Taylor's Holy Living , chap. iv., sec. vii. In the primitive Church the gift of preaching or prophesying seems to have been widely diffused and exercised among what we should call the laity, while at the same time a fixed and appointed ministry exercised the pastoral office, including therein the celebration of the sacraments and the exercise of Church discipline. This seems the explanation of the phenomena we behold in St. Paul's Epistles, in the manual called the Teaching of the Twelve Apostles , and in that curious production of the primitive Church called the Shepherd of Hermas . But though preaching and prophesying were at first very freely exercised, the disorders which arose at Corinth and other places quickly taught the necessity for fixed rules. It was just the same in the synagogue. The ritual and worship was conducted by the officials. Preaching was free and open to all, but subject to the control and direction of the ruler of the Synagogue, as the case of St. Paul at Antioch in Pisidia proves (Acts xiii. 15). Lightfoot, Horæ Hebraicæ , Acts, chap. ii., ver. 3, notes that "there is a form of prayer in the Jewish writings which was used on the solemn fast of the ninth month Ab, one clause of which illustrates the Divine symbol, 'Have mercy, O God, upon the city that mourneth, that is trodden down and desolate, because Thou didst lay it waste by fire, and by fire wilt build it up again.'" Isa. xxv. 7. See Lightfoot, Horæ Heb. , on Acts ii. Meyer on Acts (ii. 4), vol. i., pp. 67, 68. Clark's translation. The speculations and discussions now rife concerning hypnotism ought to teach modesty of assertion as to what is or is not possible. On the 28th of March there appeared in an eminent medical authority, the Lancet newspaper, a review of a number of works on hypnotism, acknowledging the wonders of the subject, and containing this expression of opinion: "It is quite impossible to assign any limits to the influence of mind upon body, which is probably much more potent and far-reaching than we are usually prepared to admit." Now among the works reviewed in that article was one by Dr. Albert Moll of Berlin, published in the "Contemporary Science Series." That book makes statements about hypnotism which would quite cover Scripture miracles at which even devout people have stumbled, such as the miracles wrought by the shadow of St. Peter, or by handkerchiefs brought from the body of St. Paul (Acts v. 15, and xix. 12), which Meyer regards as mere legendary accretions to the genuine story. Moll, however, makes quite as wondrous statements about hypnotism. On page 1 he thus begins his History of Hypnotism : "In order to understand the gradual development of modern hypnotism from actual magnetism we must distinguish two points: firstly, that there are human beings who can exercise a personal influence over others, either by direct contact or even from a distance; and, secondly, the fact that particular psychical facts can be induced in human beings by certain physical processes. This second fact especially has long been known among the Oriental peoples, and was utilized by them for religious purposes. Kiesewetter attributes the early soothsaying by means of precious stones to hypnosis, which was induced by steadily gazing at the stones. This is also true of divination by looking into vessels and crystals, as the Egyptians have long been in the habit of doing, and has often been done in Europe: by Cagliostro, for example. These hypnotic phenomena are also found to have existed several thousand years ago among the Persian magi, as well as up to the present day among the Indian yogis and fakirs, who throw themselves into the hypnotic state by means of fixation of the gaze." The phenomena mentioned in the Acts, whether as to the tongues or to miracles worked through inanimate objects, may be compared with Moll's statements on pp. 5, 6, 84, and 362. The proper preface in the Book of Common Prayer is longer and more minute than the corresponding one in the Missal. The Reformers extended the ancient form, inserting a special reference to the gift of tongues. It is a completely mistaken notion, which no one would cherish who had read history with a full-orbed mental eye, realizing the past with its circumstances, that Latin and Greek superseded all other languages throughout the empire. Local dialects and languages continued to flourish all the time, save amongst the official classes. Else how did Welsh survive to this day in England? How did Celtic survive in France side by side with Latin? The two celebrated cases of Gregory of Tours and of St. Patrick show that their Latin was of a very rude and corrupt kind; their real spoken language was Celtic, the tongue of the mass of the people. In a learned work just published I note a confirmation of this view. Professor Ramsay, in his Historical Geography of Asia Minor , p. 24, avows how his mind has changed on this question in regard to Asia Minor. "Romans governed Asia Minor, because with their marvellous governing talent they knew how to adapt their administration to the people of the plateau. It is true that the great cities (of Asia Minor) put on a Western appearance, and took Latin or Greek names. Latin and Greek were the languages of government, of the educated classes, and of polite society. Only this superficial aspect is attested in literature and in ordinary history, and when I began to travel the thought had never occurred to me that there was any other. The conviction has gradually forced itself on me that the real state of the country was very different. Greek was not the popular language of the plateau, even in the third century after Christ; the mass of the people spoke Lycaonian, and Galatian, and Phrygian, although those who wrote books wrote Greek, and those who governed spoke Latin." See again pp. 98, 99 for much more on the same subject, showing the prevalence of the native languages of Asia Minor down to the year A.D. 500. Christians often give their sceptical opponents an advantage over them by allowing them to state the difficulties of Christianity and never retorting the difficulties of scepticism. There is no historical fact of the distant past that cannot be encumbered with numerous difficulties, deduced, in most cases, from our own ignorance. No difficulty on our side is so great as that which the sceptic has to meet in undertaking to explain, on purely natural grounds, the rise and success of Christianity on the very spot and at the very time its Author had been crucified. The Christian story is simple and natural; the sceptical explanation forced, unnatural, and surrounded by a thousand appalling difficulties.